My favorite hostel ever! The location speaks for itself, best area for tourism, shopping, restaurants and bars. Bus stop is a 2 minute walk away and will take you to Valletta for some history, or Paceville for partying. Bus and boat tours also depart from a place very close to the hostel, so you get to see all of the island AND the islands of Comino & Gozo. View of Valletta & the bay is amazing, from the room. CLEAN, marble ensuite bathrooms, friendly staff. Wish breakfast was included. I spent 4 nights in this lovely hostel and I was very pleased with it. The building is very big and spacious inside, it once was a luxury hotel. The room was large, quiet and the bathroom was really goo too, cladded with luxury marble and fitted with a bath and a powerful shower. The reception was open 24/7 and the staff, from the housekeepers to the managers, was great! Location is really good too and the view to Valletta is stunning. Thanks everyone for a so pleasant stay! It has the feel of a hotel when you walk in. It's extremely clean and in an ideal location but lacks a kitchen of any type. If it had a kitchen, it'd be a 10! It was a 2night stay in a 8bed mixed dorm room. Overall the experience was good. The unusual layout of the room being on two floors was actually nice and gave a greater seperation between all the guests. There were lockers available in the rooms but without any locks so bring your own padlocks if can. Also, the cleaning stuff seemed to be under loads of pressure since they had only a very short time to pick up the rubbish from previous guests and clean up the room when we already had checked in. I chosen this place because I’ll be arriving late and they have 24h reception. 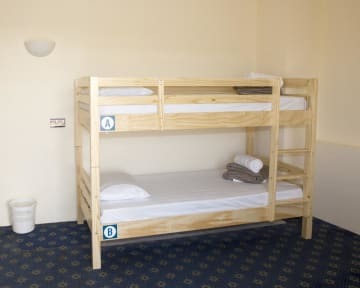 It’s basically a hotel room with bunk beds, hence the bathroom has no lock and no kitchen/common room. Overall, the price is rather reasonable and it’s pretty decent for a night or two. Overall is OK! 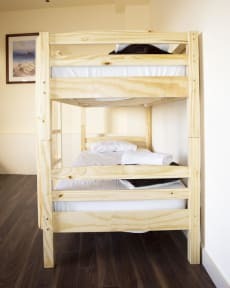 No kitchen, bad working wi-fi, beds feel like they will brake soon. Great view. The view from the rooms is awesome and the staff is very friendly. Unfortunately, the whole floor did not have electricity from 6pm to 10pm. The card for the door did not work, so it was either being locked out of the room or letting the door open, but the staff was very reactive when I ask them to change it. There are people who actually live in the rooms. No lockers. No fridge or place to store food. The place where you can store your bag for the day is not locked.